One of the best books I read in early 2010 was Josh Harris’ Dug Down Deep. Back when I reviewed the book, I called out the last chapter, “A humble orthodoxy” as being worthy of being a book unto itself. It seems others felt the same way. 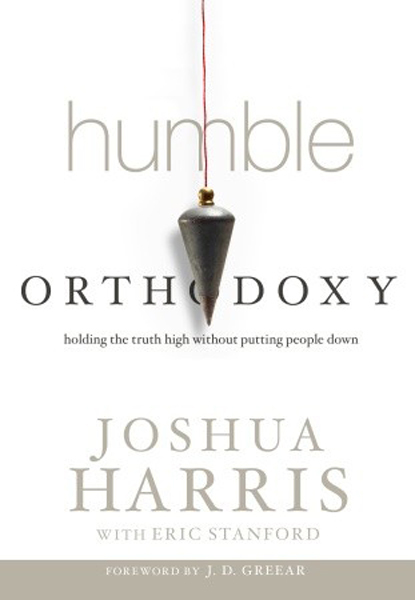 Harris’ new book Humble Orthodoxy: Holding the Truth High Without Putting People Down was released just a couple weeks ago. The book revisits and expands on the content of that final chapter, showing how doctrinal humility affects our heart and attitudes, views of others and our relationship with God. How can we be arrogant about a truth that is completely outside of anything we’ve done? If we had earned the gospel, we could be arrogant about it. If we had somehow created the truth, then we could copyright it and control other people’s access to it. But the truth is a gift from God to us. It has changed us only because he extended his mercy to us. How then can we not extend mercy to others? Sound doctrine is vital. Godly example is essential. But they are not enough. Apart from humility of heart, we will be like the Pharisees and will use the truth as a stick to beat others over the head. And God will be dishonored in that. If we would honor God, we must represent truth humbly in our words, in our demeanor, and in our attitude. I have a hard time remembering this lesson. Sometimes I suspect it’s because of insecurity. I’m not always as confident as I want to be, so the louder I get, the more right I must be. Maybe some of you know what I’m talking about. Maybe. But humility and orthodoxy are fast friends. One doesn’t really have one without the other. This is a lesson I need to be reminded of again and again. And God is gracious to provide the reminders at the right time. Because the book is an expansion of Dug Down Deep‘s final chapter, some might be tempted to write it off as unnecessary. Don’t do that. Humble Orthodoxy may not be a whole-cloth new work, but it serves as a great (short) heart check. Read this book; then go back and read it again.